One first notices that the standard attempt at a representation above does not do it justice; a Lewis valence bond drawing (in which electrons are accounted by partitioning into bonds) it most certainly is not. Nine carbons and four osmiums have absorbed 21 electrons, donated (formally) from seven lanthanum atoms. But easily discerned is that of the nine carbons, four are dicarbon and five are mono carbon. It is worth exploring the immediate environment of each of these types. 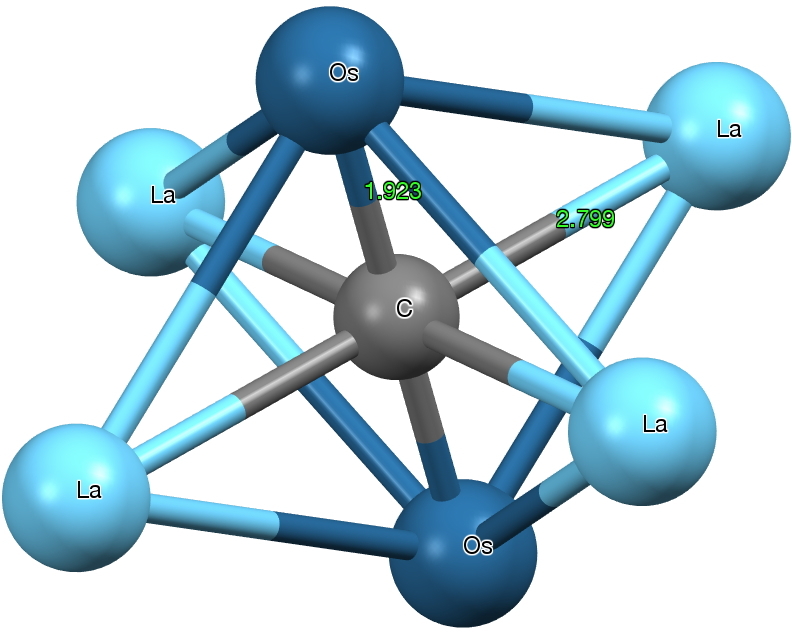 The monocarbon is in fact hexa-coordinated by two Os and four La, a form of carbon coordination that was only relatively recently identified. But the dicarbon unit is if anything even stranger. The C-C bond length is ~1.316Å (a relatively long distance compared to many carbides) more or less commensurate with a double bond. The carbons are both end-on σ-coordinated and also triply π-coordinated. with one more metal coordinating in a manner somewhat in-between these two modes. One carbon is 5-coordinate, the other 6-coordinate. The Os-C bond length has a relatively short value of 1.93Å (the sum of the double bond covalent radii for Os and C is 1.83, the single bond radii 2.04), and so it might be tempting to represent it as Os=C=C. This one example reminds us that even an element such as carbon, where one might imagine the bonding environments would be well-known, can still reveal unusual behaviours. Taking a look at the histogram below, which indicates C-C lengths in Metal-CC-Metal complexes (where the carbon coordination is restricted to 2) indicates the diversity of behaviour possible with this simple little ligand. This entry was posted on Wednesday, July 3rd, 2013 at 11:19 am and is filed under Interesting chemistry. You can follow any responses to this entry through the RSS 2.0 feed. You can leave a response, or trackback from your own site. Octahedral hexacoodination carbon was “well established” much earlier in CLi6, neutral, radical cation, and dication in J. Am Chem. Soc. 1982, 104, 4275; 1983, 105, 5930 and verified experimentally in Nature, 1992, 355, 432. Thanks Paul for those valuable citations. Tetrahedral carbon coordination was famously established in 1874, but 5 and 6-coordinate carbon had to wait ~100+ years to become established. I suspect in some carboranes the coordination is even higher! At the end of my post, I showed a search of some 50 M-CC-M systems, revealing the diversity of bond lengths that are shown. Here I attach two further plots. A further variable is added, the M-CC angle, and the search is also repeated for M-NN-M. Notice how for the M-CC-M system, almost all the examples are linear, whereas for the (possibly isoelectronic) M-NN-M systems they cluster into highly bent and linear. Amongst the linear cluster, again a diversity of bond lengths is observed. Oddly, the (again possibly isoelectronic) CN(-) anion shows much less distance diversity, clustering at around 1.15Å, very large variation about the M-N-C angle, and almost none about the M-C-N angle. Paul in his comment gave a short history of the discovery of 5- and 6-coordinate carbon. I thought I would do a simple scan of the CCDC with the following search definition: a single carbon, specified to have 5, 6, 7 or 8 bonded atoms (along with R factor < 0.05, no disorder, no errors). The results were as follows: 5: 2061 6: 1796 7: 19 8: 4 Which of course begs the question: how is a bonded atom defined? One would have to look up the criteria used by CCDC to index its structures, but we should be aware that a bond is probably not defined in any Lewis sense of shared electrons. Most probably its done on the basis of distances, and the hits above do not carry much semantics regarding the type of bonding associated with eg an 8-coordinate carbon. With the caveat as above that the definition of a coordination/bond to the central atoms is rather arbitrary (there is no simple way of computing this, even from a high quality wavefunction), the difference between C and N is striking. 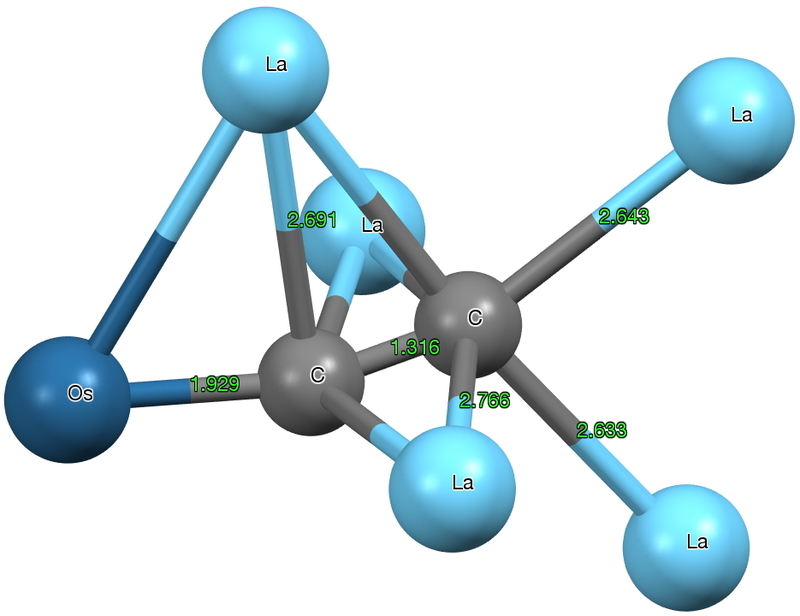 I again remind that these numbers may be an artefact of the way that CCDC define a “bond”, but one may presume at least they are consistent between B, C and N. And of course one is assuming that the distribution of reported crystal structures is not biased against any one of these elements. Here is another exploration of coordination using the CCDC, this time the coordination number of hydrogen, H.
(for a search with R < 5%, no disorder, no errors).